Bulgarian journalists and journalism students participated in a three-day training designed to introduce them to feature story writing in the public interest as well as to the issues that merit reporting in the extractive industry in Bulgaria. Participants listened to presentations, took part in professional discussions, and performed reporting in the field, collecting data and taking interviews for their feature articles. Experienced journalists facilitated the workshop: Sabev, an economist, reporter and author of investigative materials on the mining and energy sectors in Bulgaria; Ruslan Yordanov, a reporter for Standard (a national daily); and Dr. Pavel Antonov, co-founder and editor of online citizen network BlueLink.net and its online magazine Evromegdan.bg. Alexander Kodzhabashev, a prominent lawyer specialized in environment protection who has defended the interests of diverse environment protection groups and organizations in court over the past quarter of a century, took part in the workshop. The workshop was part of ‘Extractive and Energy Industry Watch’ - a project by the NGO Support Programme of the EEA Grants in Bulgaria. 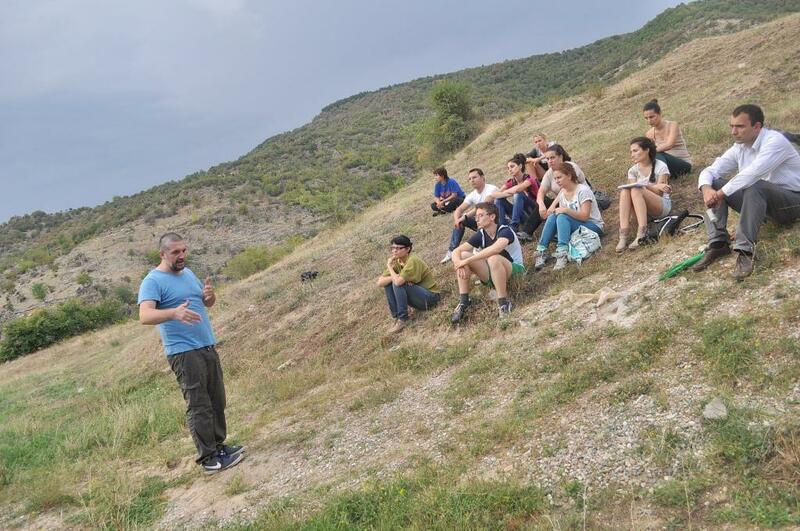 Organized by the BlueLink Foundation and the Environmental Law Centre, the journalism training took place in Vlahi, 9 km from Kresna, in the South-West of Bulgaria.The location for the workshop was hardly chosen by accident. Vlahi has recently become extremely attractive to freedom-loving people who have decided to escape from the grip of excessive consumption and live in harmony with nature. At one point, the village had a population of approximately 2,000 people but it dropped to a handful in the end of the 20th century. Starting in the late 1990s, however, the village has welcomed new settlers who have renovated the village school, which now functions as a School for Nature, and the church, rebuilt some of the houses and protected representatives of the old shepherd species. In addition to the School for Nature, whose founders have led environmentally sustainable lifestyles for more than a decade, other activists have also chosen Vlahi as the place to pursue their goals. These include the Balkans Wildlife Association, which runs a center for visitors and a shelter for predators, and Semperviva, which has revived the karakachan dogs and sheep. 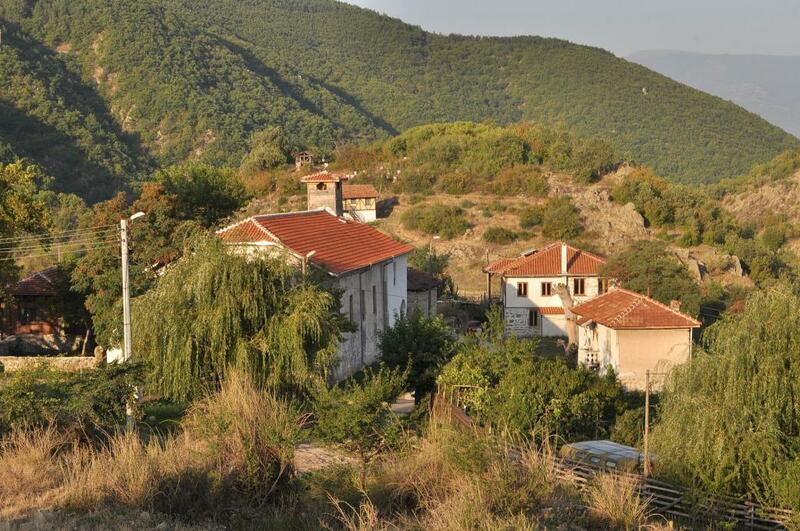 Vlahi is also home to the public center Sharalia, where guests can find comfortable accommodation in an energy-independent house and learn about the principles of permaculture. 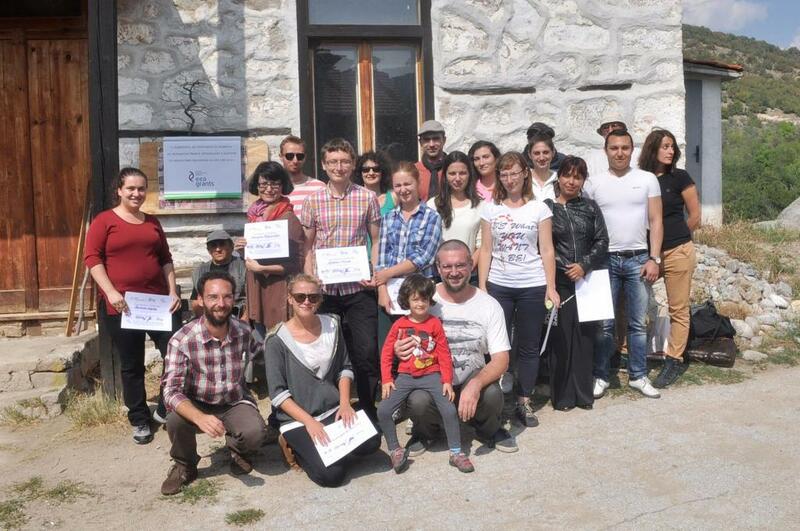 The organizers of the training chose Vlahi for one more reason: the village shows how the energy and extractive industries affect the people and the environment. Indeed, this was precisely what the organizers from the Center for Ecologic Law and the Blue Link Foundation aimed to achieve, namely to introduce the young participants to the principles of operation of this industry and the methods and instruments it relies on, and to inspire them to investigate why the state and the law often yield to big economic interests. To be able to do this, the participants had to learn how to use the available journalistic and legal instruments for greater transparency in the industry. They also had to master the art of telling informative and reader-friendly stories and present them as features. The people leading the training had the necessary back ground. Ruslan Yordanov has written an investigative piece on the extractive and energy industry. Dimitar Sabev runs a blog about economics and he has also written two books on topics related to this industry. Pavel Antonov offered precious advice on telling memorable stories drawing on his experience as the anchor of a show on Nova Television and as the editor in chief of the international magazine Green Horizons, whose newsroom is in Hungary. The organizers set themselves an ambitious goal: to teach the participants the principles and ethical rules used in prominent international media, such as The Guardian and The New York Times and give them the chance to put this principles and rules into practice while investigating a real-world problem related to the extractive and energy industry. The training started in Sofia in the afternoon on 18 September 2015. The participants got to know one another for the first time and were introduced the principles guiding the editorial process at Evromegdan.bg: topic selection, research, fact-checking, working with sources, story organization and story-telling, and how to seek the truth in every story without falling prey to prejudice but instead listen to all sides involved, always keep the readers in mind and remember that hard work and persistence can lead to positive changes in our world. In the morning on 19 September, the group set out on their trip to Vlahi. Two out of three students from the American University of Bulgaria, who were selected for the program, did not turn up: one of them had attended the opening event on Friday, while the other one did not show up at all. Having arrived in Vlahi, the group immediately started its work. By the end of the day, they learned about the history of energy and mining, the process of privatization in the sector, who and how takes over major power plants and other lucrative businesses in the sector. Dimitar Sabev taught the participants how to navigate the massive pool of information available and easily accessible online. He showed them how to make use of quasi-secret credible sources of data such as registers, statistics and reports published on the websites of the various ministries and other state institutions. We call them quasi-secret because they are indeed there, accessible in seconds with the click of the mouse, yet they can easily confuse and irritate the people who seek particular information but don’t know where and how to find it. The third day involved work in the field, including taking an interview from a source and exploring the Vlahi River, along which there are several hydroelectric power plants. Dimitar Vasilev, a co-founder of the School for Nature, one of the people who started the green movement in Bulgaria in the late 1980s and a committed activist for environmental protection to this day, told the participants how these hydroelectric power plants were built and given permission to operate, how the locals realized that the volume of water in the river was decreasing, how they notified different institutions of irregularities, how they were threatened and what problems they have had while trying to protect the river, the forest and the flora and the fauna there in court. Before the participants and the organizers moved to the dining hall for a delicious and fun dinner with their hosts, Dimitar Sabev (pictured left, talking to participants) showed his latest discovery: he had noticed an orthographic mistake in the new mining strategy of the Bulgarian government. The document looks like someone had added some information in the very last moment but nobody dared to edit these changes. The government adopted the document with the mistakes inside, which also raises the question whether someone had really proofread it. The participants, thus, learned an important lesson: every high-striving journalist needs to be able to go through long and oftentimes boring fact- and jargon-ridden documents so that he/she can detect irregularities. The last day was set aside for creative work. The aspiring journalists set down on their computers, looked at the information and data they had collected and started crafting their stories. By lunchtime, all participants had presented the first several paragraphs of their features and received specific feedback. From then on, it was their turn to go ahead with collecting even more information, to check their sources and write informative, logically structured and well-written features of publishable quality. Those interested received an offer to keep writing professional journalistic pieces in the public interest for Evromegdan.bg. This text is publlished as part of the Extractive and Energy Industry Watch project of the Environmental Law Centre and the BlueLink Foundation in Bulgaria with the financial backing of the NGOs' Support Programme of the EEA Grants for Bulgaria. No responsibility for the content of this articice could in any way be attributed to the EEA Grants and the programme's operator in Bulgaria. All responsibility for the content lies with the Environmental Law Centre. 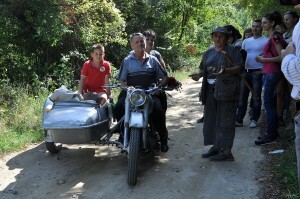 More on the same subject: A journalistic workshop in Vlahi, photo gallery by Ruslan Yordanov.